PRWIN's Valuable Resource and Funding Supporter. The past 20 years has seen an increased focus on water quality issues, including nuisance algae and beaches posted as being unsafe for swimming. This situation is caused by a combination of nutrient and bacterial pollution from private septic systems, municipal wastewater, agriculture, and natural sources. Canada and Ontario, in partnership with local municipal governments, health units, conservation authorities and local organizations, are working to develop and implement recommendations for actions to deal with these concerns. To address algae issues and beach safety concerns, all partners are focusing on and coordinating actions that are aimed at lowering the amount of phosphorus and reducing incidences of high levels of bacteria (such as E. coli) entering the water. Lowering phosphorus levels in the water will reduce algae growth. If we take actions to minimize bacteria entering the water, this will reduce risks to human health and result in fewer beach postings. Five key watersheds have been identified as priorities for immediate action. The group works together with local partners to develop and support the implementation of watershed management plans, with targeted actions such as tree planting or other erosion control projects, as well as monitoring and research needs, for each priority area. 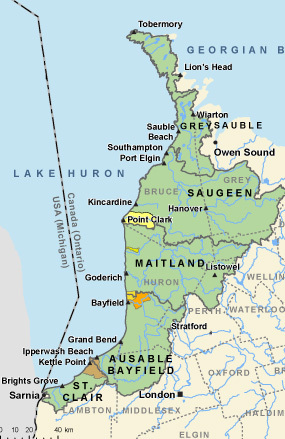 Note from PRWIN: PRWIN’s work, with the co-operation and participation of local residents, is made possible by financial support from Environment Canada, Ministry of the Environment and Climate Change, Healthy Lake Huron Group, the Township of Huron-Kinloss, Bruce Power, and many, many other business partners, local agencies, and through donations in our Sponsorship Program.